This post is written by Anusha Devi Nawoor, UNM 2018 3MT® Winner and PhD student from the School of Biomedical Sciences. Have you heard of the disease gout? I’m sure many of you have heard about it somewhere! Your own grandparents or relatives may have this disease. It’s a type of arthritis which affects millions of people globally. The first drug given to any gout patient is allopurinol as it is the cheapest and most effective one. Do you know that people are also dying from taking this common drug? A small percentage of patients experience fatal side effects such as Stevens Johnson Syndrome and Toxic Epidermal Necrolysis. If you haven’t heard of these side effects, Google it, you will definitely be shocked! (Warning: the images may be disturbing to some people) The mortality rate is 10% to 30%! And that’s a lot of lives lost! Up until a few decades ago, we did not know what was causing these fatal side effects. Scientists recently found that the answer lies in our genes! Specifically the Human Leucocyte (HLA) genes, which control our immune system. HLA genes react with drugs to cause these idiosyncratic side effects. The HLA-B*58:01 gene was discovered as the genetic marker for allopurinol-induced side effects. My PhD is all about designing a method to detect the HLA-B*58:01 allele in gout patients before they are given any drug at the hospital. Patients who test positive for this gene cannot take allopurinol and they are given an alternative drug, thus avoiding any possible side effects. Patients who don’t have the gene can safely take allopurinol. Simple right? The method we designed takes only 1 hour and a half to run; conventional methods take weeks to months. It is also ten to a hundred times cheaper than current methods! With that said, I welcome you all to the future of the medical world – Personalised medicine! Patients will be given drugs and treated in hospitals based on their unique genetic make-up! We are all unique and that uniqueness will be the guide for your treatment. No more side effects. No more suffering. And no more deaths. This was my speech in a nutshell for the 3 Minutes Thesis (3MT®) Competition, which was organised by the Graduate School on the 5 September 2018. Preparations started a month earlier, with our abstract submission, the selection process, static slide submission and the numerous training sessions led by Dr Jiin Woei Lee and Dr Tissa Chandesa. The training sessions were important as we learned how to design our slides, deliver our speeches and even got some advice from previous 3MT® winners. Dr Lee and Dr Chandesa are the ones who truly deserve all the praise for preparing us for the 3MT® event and helping every single participants for a whole month! 3MT® was an inspiring and helpful event for me. First, to compact research done during 3 years into 3 minutes was truly a challenge. Which parts to include and which ones to exclude, when every single thing was made of your blood, sweat and tears. My first speech draft had a total of 1,000 words and sent me running to Dr Lee’s office in despair! We then worked together to cut down more than half of my speech and to structure it properly. The next thing on my to do list was sending my speech to my mother, sister and a few of my friends. This 3MT® speech was to be delivered to a general public with no prior knowledge about our complex research. The best way to ensure that everyone would understand it is to send it to people who are not in your field of research, get their feedback and make necessary modifications. A big shout out goes to my friend Tasneem Abbasakoor who spent 3 hours with me on a Skype call listening to me practise my speech over and over again (poor her)! Another challenge was to memorise the whole speech and deliver it within 3 minutes, not a single second more than that, as participants will be automatically disqualified if we go over 3 minutes. I practised day and night, while eating, walking, showering and basically while breathing. One day before the event, we had a full day practice session in the Great Hall with Dr Lee. I have to say, that day is probably what helped me the most! Being on stage and practising my speech numerous times there really helped me relax and feel more confident. All the participants kept on practising their speeches all day with helpful pointers from Dr Lee, while guzzling down lots of coffee. It took me around five to six times of practice on stage to finally master my speech and its delivery. I started out by reading off my script in a dazed state, to going over the time limit numerous times and I finally succeeded in the last rounds. On the 3MT® competition day, I was high on nerves again as it was a biological and psychological reaction I unfortunately cannot turn off completely! However, I felt all of that melt away when I saw my friends who came to support me. I’m lucky to have such good friends who were encouraging me throughout the whole event and helped me calm down and relax before my speech. A big shout out goes to Rachel, May Zie and Grace! I didn’t expect to win as my speech did not go as planned. I lost around 6 seconds at the start as my slide wasn’t displayed when the timer started and I had to improvise and cut my speech down in the end to finish on time. I just delivered my speech to my best ability with some improvisation thrown in! As we were told over and over again by Dr Lee and Dr Chandesa, no one knows our speech but us, so any improvisation will not be noticeable by anyone. You have to own your speech and deliver it in a convincing way! At around 2 minutes 50 seconds, I could see all my friends flailing around wildly, telling me to stop right away. I finished my speech on the dot, at 3:00, with a weird buzzing noise in my head. I felt numb, owing to everything that happened while I was on stage. I was just glad that I was able to deliver my speech within the time limit. Winning the 3MT® competition was not even a possibility in my mind! Everyone else did an awesome job of delivering their speeches powerfully and in my head I didn’t stand a chance against them. When the top 3 winners were being announced, I was hoping that I could at least be in third place. One of the judges listed off what they were looking for in our presentations, and a few things corresponded with my presentation and that’s exactly when I felt some hope blooming. They announced the runner up and the 2nd runner up and my jaw had already dropped by then. They were the two participants who I felt were the best during the competition! I was confused and my whole face was scrunched up. Then they announced my name as the winner and I shouted ‘WHAT’ loudly! It took me a few seconds to process what was happening and then I went on stage, with small, unsure steps and with my hand on my mouth, in the stereotypical ‘shocked pose’. But soon enough, the shock melted away and I was ecstatic to be standing on stage with Yap Jing Ying (runner up) and Denesh A/L Sooriamoorthy (second runner up). We did a group hug and small cheer for all the effort we put in! It was truly a great opportunity for all of us to master public speaking, share our research with the world and most importantly have fun with our peers! My advice to my fellow postgraduate peers would be to actively participate in 3MT® as it helps you master public speaking, get rid of any stage fright, spread the word about your research and see people’s reaction to it. There is no better gratification than seeing people understand the importance of your research through a 3 minute speech! Interact with the crowd, ask them questions during your presentation, engage with them so that they give you their full attention during those 3 minutes. The recipe to success, is through continuous practice and by showing the dedication you have for your research topic. Your passion for your research will shine through in your speech and get people hooked on your every word. Design your speech in a way which will be relatable to the crowd and that will be enough to pique their curiosity. This spreading of awareness on different topics, drugs and diseases is what is truly important. As it is said, “Scientia potentia est”, which means “Knowledge is power”. I truly thank the Graduate School for giving me the opportunity to share my research on such a reputed platform and to hone my public speaking skills during the 3MT® competition! Anusha (right) accepting the award from one of the judges, Mr Julian Matthews. 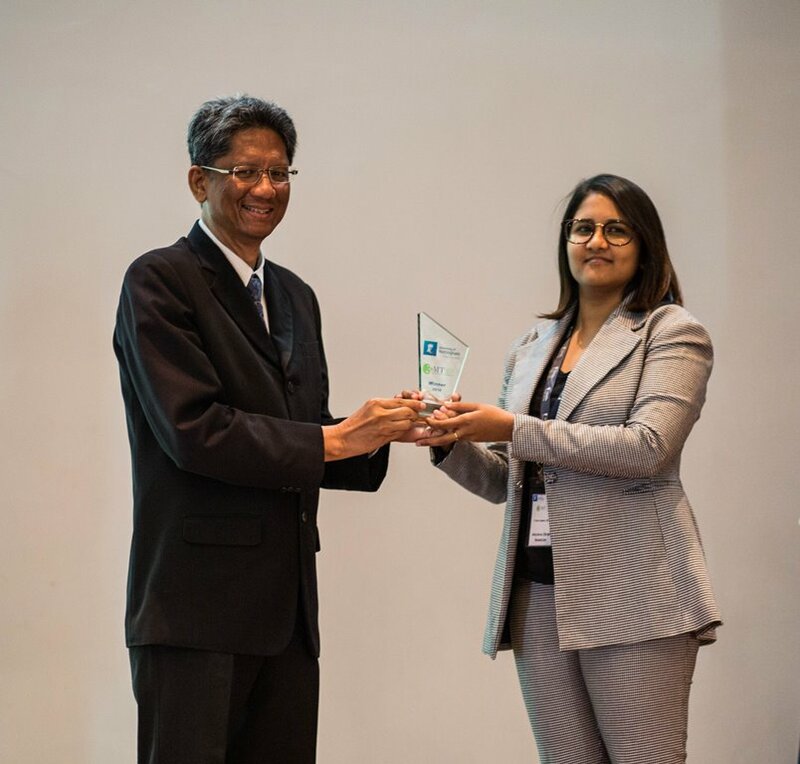 Anusha Devi Nawoor was crowned the Winner for her presentation entitled “The future – Personalised medicine!” at UNM 3MT® 2018 Competition held on 5 September 2018. 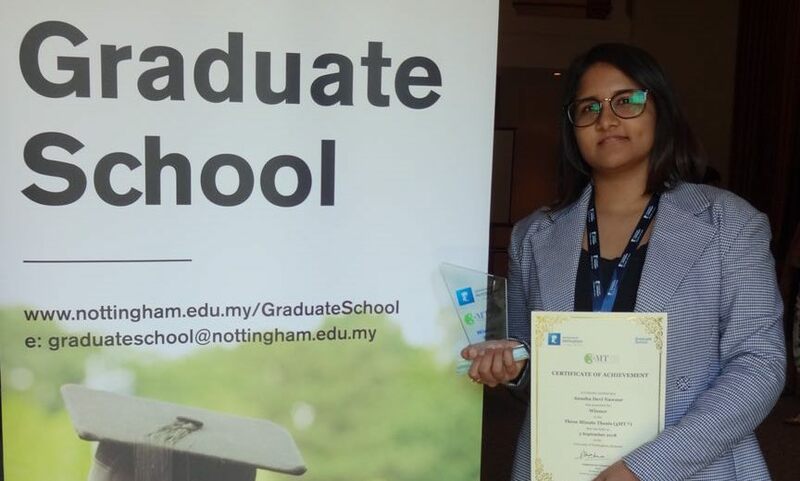 In her winning presentation, Anusha described her research on making allopurinol treatment safer for gout patients by incorporating a newly designed genetic screening method to prevent allopurinol-associated drug hypersensitivity. Read more about the winners of UNM 2018 3MT® Competition.